I meet Massimo Bottura at IFA 2017 in Berlin, during his collaboration with Grundig. With the appliance company's focus on sustainability and energy efficiency, stronger than ever, buddying up with this particular world-famous chef, is a smart move. "It all started after the Universal Exposition (Expo 2015). They came to me and instead of being interested in Osteria Francescana or Massimo Bottura, they were interested in Food For Soul." Food For Soul is the non-profit organisation Bottura founded that fights food waste by opening community kitchens around the globe and sourcing foods that would usually go to waste. The initiative has brought together public and private organisations, some of the world's best chefs, food suppliers, artists and designers who have worked together to produce nutritious meals for those in need. 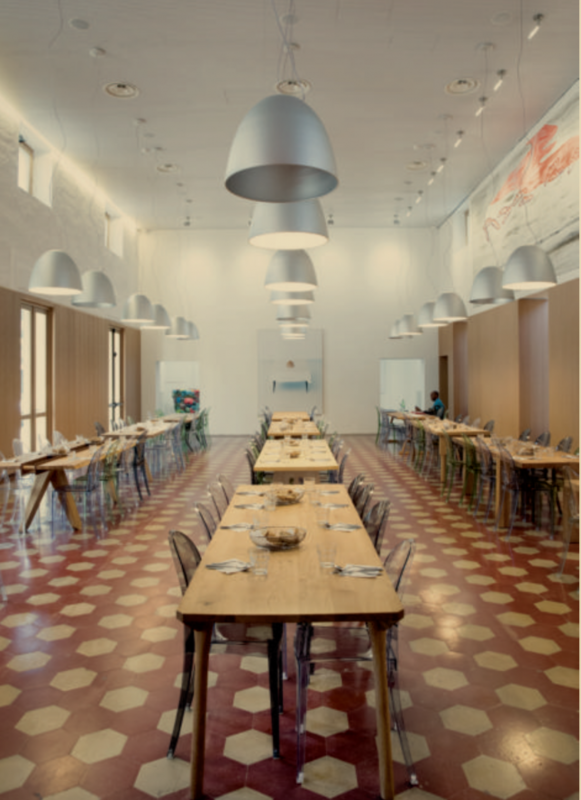 So far, and in two short years, Food For Soul has set up three community kitchens, Refettorio Felix (London), Refettorio Ambrosiano (Milan) and Refettorio Gastomotive (Rio de Janeiro). Food, art and creativity are a universal language. Our community kitchens are not pop-up projects but are designed to last sustainably. We create vibrant community hubs that can be used for social purposes. We encourage educational workshops, vocational training, lectures and events that raise awareness on food waste and promote healthy and sustainable eating habits not only among guests but for the whole community. "When Grundig approached me, it was interesting because I was in touch with many companies to try to raise money and no one would," Bottura admits. "In Brazil, for example, not a single Brazilian company gave us one penny. They approached me because they have the same view on technology as I do on food," Bottura says. "So, I saw the development of their refrigerator that alerts you with a red light to tell you when you need to use what etc... These are things that are going to help families save money and waste less, and that's the point of what we do, too," he says. Both Bottura and Grundig keep ethics close to the aesthetic. It's no more about how beautiful the dish is or how beautiful the design is, it's also about how ethical it is. "This is something that really interests me. I'm a contemporary chef in 2017 that usually cooks good food but also healthy and ethical food. This makes all the difference in this world," Bottura adds. "I'm not doing TV. If you are involved in a cooking contest, it's just an audience. How can you promise a young chef that, in six months time, he's going to win a contest? This is crazy, bulls***. Back to Food For Soul, I ask Bottura which foods are predominantly going to waste: "In Rio, it was all about vegetables and fruit," he says. "They burn eleven big trucks of fruit and vegetables, every day, and 2.5 million people are living on the street with nothing to eat. To me, that was mind-blowing. In London, much like Milan, an incredible amount of chicken was going to waste. Once, we received a delivery of eighty chickens from Bresse. Raised and fed with milk, these are the most expensive chickens in the world – and they were delivered to the Refettoria Felix. I couldn't believe that I was in London cooking Poulet de Bresse, it was crazy," he says passionately. Bottura's passion for making a difference is certainly infectious. His energy and drive to make us all aware of food waste and sustainability is a force to be reckoned with, yet he knows where to leave his mark. 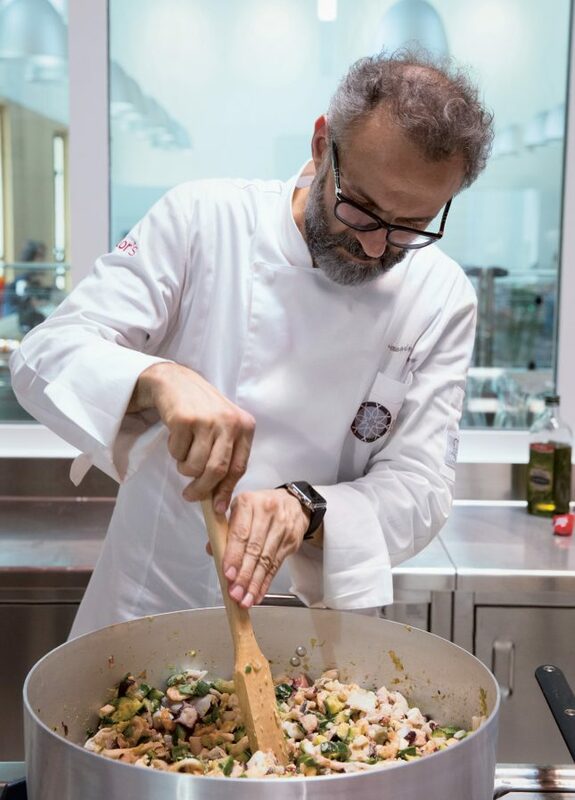 As the subject of the pilot episode of the Netflix documentary series Chef's Table, as well as the 2016 movie Theater of Life, Bottura is hyper-aware of spreading himself too thin. "I'm not doing TV. If you are involved in a cooking contest, it's just an audience. How can you promise a young chef that, in six months time, he's going to win a contest? This is crazy, bulls***. I'm appearing on on things like Chef's Table, where we film a documentary for three weeks and show what real cooking is. Cooking is an act of love – it's about hard work, every day. Every day, you are focussed on what you do with big dreams and social projects." Bottura's love for Netflix, to get his message across, doesn't end there. Fans of the Netflix series Master of None may have noticed his cameo appearance in season two, which is partly set in Modena, Bottura's hometown. The show, starring and co-created by Aziz Ansari, may have deep-rooted comedy beginnings but has, evidently, become a show about food. "Aziz is very passionate about food and quality," says Bottura. "He learned how to make pasta – I think better than most of the young chefs," he laughs. "We became friends that really respect each other.  TV shows like Master of None are very important platforms." "My grandmother always said that when a pig gives his life for a family, we have to be respectful. We have to use every single part of it to create something special." The Italian chef has looked at the numbers: "860 million people in the world don't have anything. 1.5 billion are over weight, 1.3 million tonnes of food is wasted every year – that's 33% of the production – it's insane. You'd need a quarter of that waste food to feed those 860 million people. My grandmother always said that when a pig gives his life for a family, we have to be respectful. We have to use every single part of it to create something special. For me, the new movement is not that new, but we need to communicate this to the world and to the young generation of chefs. And the world will change. This is why I called my friends and told them I needed their help. It turned out to be the most significant message at Expo 2015. After that, France and Italy passed the law against food waste and now, in the UK, they are having discussions to pass it, too. The chef, in 2017, is much more than the sum of his recipes." So, how can we become more aware of the food we waste at home? Bottura says it's all about asking our food the correct questions. "If you ask the right question to an overripe tomato, it will tell you that it's not good on salad but very good for pasta sauce. If you ask the right question to a two-day-old piece of bread, it'll tell you that it's perfect when sliced and toasted for bruschetta. Ask the same question to four-day-old bread and it will tell you it's great for bread crumbs or passatelli," he says. "I don't want to call it waste anymore – just ordinary ingredients." Food For Soul as a cultural project, and not as a charity project, is a message Bottura really wants to convey. His collaboration with equally as passionate people, in an effort to change our perspectives around food, is clearly evident. He finishes the interview by mentioning one very important factor; his wife Lara, who has a big involvement with Food For Soul and who he credits for moving things forward: "She's the president of Food For Soul and the one who always keeps me grounded. I'm over the top. She found the way for the project to become real." Bread is Gold is the first book to take a holistic look at the subject of food waste, presenting recipes for three-course meals from 45 of the world's top chefs, including Daniel Humm, Mario Batali, René Redzepi, Alain Ducasse, Joan Roca, Enrique Olvera, Ferran & Albert Adrià and Virgilio Martínez. Up to 150 recipes turn everyday ingredients into inspiring dishes that are delicious, economical, and easy to create. 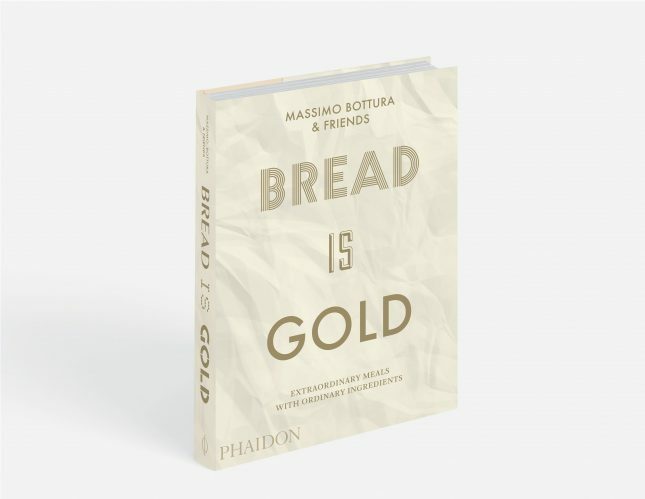 Bread is Gold by Massimo Bottura and Friends is available to pre-order now, from Phaidon.com for €39.95.